Carbon copy of letter from George Mason College director, John Norville Gibson Finley to the Superintendent of the National Capital Parks. 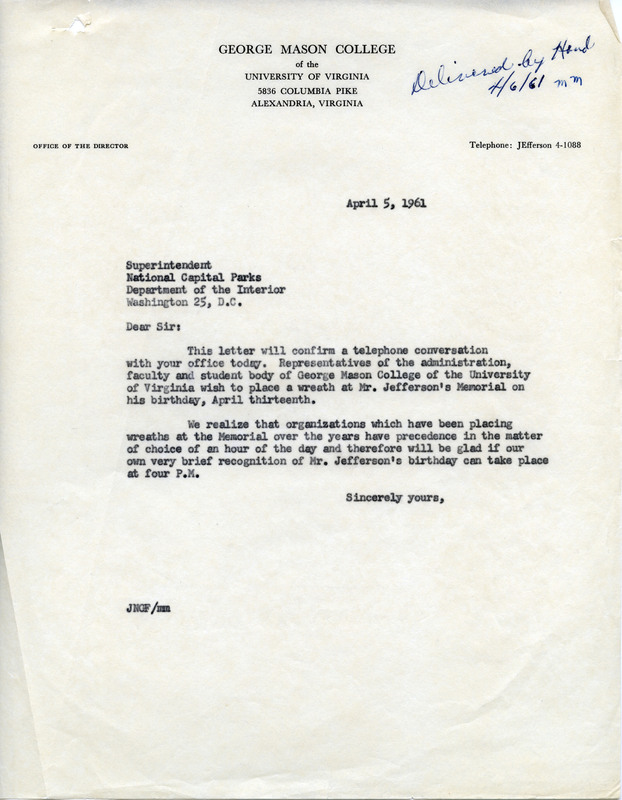 In this letter Finley is asking permission for representatives of the college to lay a wreath at the Jefferson Memorial in Washington, DC on April 13, 1961 at 4:00 PM as part of the branch's celebration of Founder's Day. One page. Marked at top in blue ink: "Delivered by Hand 4/6/61 mm"
Citation: Finley, John Norville Gibson, “J.N.G. Finley to Superintendent, National Capital Parks, Department of the Interior, April 5, 1961,” A History of George Mason University, accessed April 26, 2019, http://ahistoryofmason.gmu.edu/items/show/127.